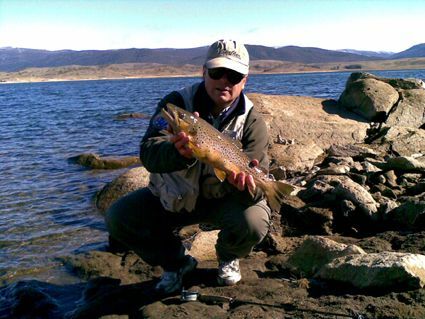 Headlines: Lake Jindabyne has had some nice Browns coming in off the bank on Bait and Fly. Lake Eucumbene has been excellent on the troll and Flyfishing has been good also. Lake Eucumbene:- Fly reports have picked up considerably on days when the weather is better. 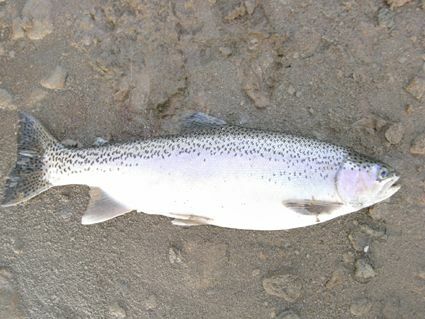 The Anglers reach area has produced some great Rainbows. Polaroiding is still an option for Browns in the Dam Wall area or searching with a streamer on an intermediate sinking line, will find you fish during the day if visibilty is limited. Best area to do this is the dam wall and some of the steeper shores adjacent to this. Try using Olive Matukas, Beadhead Woolly Buggers, and nymphs. The River end of the lake fired on the weekend with some great Rainbows being taken. Another area for some good fishing. Ended up catching about 3 fish per angler (five anglers) on Sunday, all Rainbows from the river end of Eucumbene. Fat fish, and the ones we kept were full of eggs, but empty stomachs. The mud is something to behold, waders highly recommended, and a tea towel to dry your hands after handling fish, there is patchy snow on the ground and icy breeze. The fish seemed to come on in the late afternoon 3 pm'ish. Lake Jindabyne:- Jindabyne has turned on some good polaroiding for some when conditions allow. Sunday was a good day conditions wise but only received the one report below. The fish don't appear to be widespread, so it is best to cover as much ground as possible till you find them. The Eastern shore early in the day and the Western shore in the early to late afternoon are the best options. If you have a boat that will give you more shoreline access. Don't despair if you are only on foot, as with a little persistence, you can still find fish. With recent rain and snow falls the Thredbo river will have had higher water levels and the fish will drop out of the river back into the lake. These fish will be looking to feed up and put some condition back on and will provide some good fun fishing when a clear sunny day prevails. Eucumbene:- Trolling reports have been quiet but the fishing will be as good as it was in last weeks report. Big Rainbows are the main target at present both getting deep and on flatlines Depending on the conditions. Working deeper open water will find some quality fish. Soft Plastic spinning is another method worth using in the Lake at present. Spinning the trees on the Western shore or the Dam wall should turn up a few nice fish. Squidgie fish are the best lures overall. The new'Alex' minnow lures from Serbia are still producing too. These lures are made with Balsa wood and are a deep diver that come in very good Trout catching colours. Check them out. Jindabyne:- No reports but the Kalkite and East Jindabyne, Sids Bay and East Jindabyne areas are well worth trying early in the day. Try deeper with leadcore or a down rigger during the midday period. Baitfishing :- Bait fishing was very good in Jinabyne with Scrub worms on the bottom taking some nice Browns. Grubs (if you can get them) will also produce. 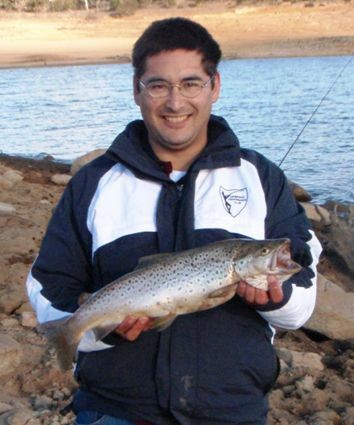 *Good evening, I just spent the afternoon (2nd Aug) fishing from 2  6 pm at Kalkite, Lake Jindabyne. Only caught one fish at 3.15 pm, weighed 1.6 kg, I think it ate both the Worm and the Powerbait. Im pretty sure it was a Brown trout. It must have been one hungry fish, its stomach was jam packed full of yabbies. *Gary and Laurie from the Lakeview fishing club and a couple of tough days trolling in cold, wet and miserable conditions for no fish. 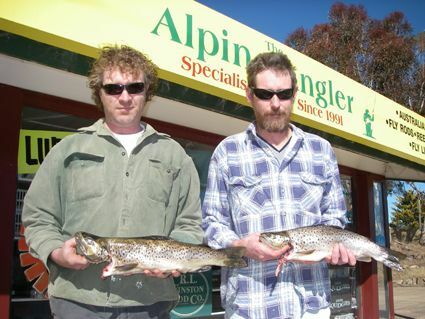 They pulled up onshore to soak a couple of Scrubbies, and were rewarded with these two very nicely conditioned Browns. These fish pretty much saved the trip.